October 31, 2017 – Des Moines, IA – Earlier this month, the Iowa Restaurant Association, along with The Soyfoods Council and the Iowa Beef Industry Council, set a new standard for unique proteins on a plate. The Iowa Restaurant Association’s 2017 Culinary Competition challenged top chefs across Iowa to create an entrée featuring beef flank steak and a soy based side dish or sauce. The two unexpected Iowa products combined to create an exemplary event which showcased the versatility of both beef and soy in a wide variety of dishes. The chefs first presented their dishes to a team of judges who traveled to each competitors’ restaurant to taste and score their creations. Judges included Chef Robert Anderson CEC-CCE, Executive Chef and Program Chair at the Iowa Culinary Institute, Des Moines Foodster Blogger Nick Lucs, and representatives from event sponsors The Soyfoods Council and the Iowa Beef Industry Council. The chefs then prepared sample-sized portions of their dish for nearly 300 attendees at a People’s Choice event held at The Atrium at Capital Square in Des Moines on Oct. 5. Awards and cash prizes were given to the winner, runner-up, and People’s Choice winner. The Iowa Beef Industry Council is funded by the $1-per-head National Beef Checkoff Program and the $0.50-per-head Iowa State Beef Checkoff. Checkoff dollars are invested in beef promotion, consumer information, research, industry information and foreign market development, all with the purpose of strengthening beef demand. For more information, visit www.iabeef.org. September 25, 2017 – Cedar Rapids, IA – Via Sofia’s Italian Kitchen Owner/Operator John Khairallah has been selected as the first ever Iowa Restaurant Association American Dream Award winner. Khairallah will be recognized at an award ceremony at the Temple for Performing Arts in downtown Des Moines on October 5th. This award honors an individual who has had to overcome significant obstacles in order to achieve their goals in the restaurant industry. September 25, 2017 – Des Moines, IA – Paul Rottenberg, President of Orchestrate Hospitality in Des Moines, has been named the Iowa Restaurant Association’s 2017 Restaurateur of the Year. Rottenberg will be recognized at an awards ceremony at the Temple for Performing Arts in downtown Des Moines on October 5th. Orchestrate Hospitality is the managing company of popular greater Des Moines restaurants including: Centro, Django, Gateway Market & Café, Zombie Burger, Malo, Bubba and others. This award honors the restaurant, bar or tavern owner(s) who demonstrates originality, quality and service to customers, has impacted their community, and has contributed to the positive image of the hospitality industry in Iowa. August 16, 2017 – West Des Moines, IA – Fried food wasn’t the only foodie favorite at the 2017 Iowa State Fair. On Monday, hungry fair-goers sampled original soft silken tofu-based salad dressing creations from four local, professional chefs including this year’s champion Chef Tag Grandgeorge from Le Jardin. The competition, which was hosted by The Soyfoods Council and the Iowa Restaurant Association, took place in the Agriculture Building where crowds watched each chef make and discuss their dressings in front of a panel of professional judges. The competing chefs were challenged to make salad dressing recipes which used Mori-nu Soft Silken Tofu as the base of the dressing, were consumer friendly, and were delicious enough to put on a restaurant menu. Each chef demonstrated the process of making the dressing and then served four judges as well as a crowd of fair-goers. Contest judges included Iowa Soybean Association Board of Director member and Iowa farmer, Steph Essick; Iowa farmer and Food & Swine Blogger, Cristen Clark; Des Moines Register Food & Dining Reporter, Brian Carlson; and Chairman of the Iowa Restaurant Association Board of Directors, Mike Holms. All of the chefs’ recipes are available online at both the Iowa Restaurant Association and The Soyfoods Council websites: www.restaurantiowa.com and www.thesoyfoodscouncil.com. The Iowa Restaurant Association is an advocacy organization supporting Iowa’s industry with educational and promotional programs across the state. www.restraurantiowa.com. August 4, 2017 – West Des Moines, IA – Over the past week, the Iowa Restaurant Association has received a number of questions about the use of copper cups in serving of Moscow Mules and other summer beverages. Much of the confusion has stemmed from a recent Advisory Bulletin issued by the Iowa Alcoholic Beverages Division about the use of copper mugs. The Iowa Restaurant Association has been in contact with both the ABD and the Department of Inspections and Appeals (DIA) on the issue. According to the ABD, this bulletin was issued after a licensee was advised by DIA that the mugs it was using did not meet federal Food and Drug Administration (FDA) food safety standards. Because licensees/permittees who serve alcoholic beverages must comply with applicable federal and state food safety regulations, the ABD decided to issue an advisory bulletin last week. To clarify, the Iowa Alcoholic Beverages Division does not inspect or issue citations over copper mugs or cups. An establishment cannot lose their liquor license simply because they have copper mugs or cups. An ABD investigator, like any patron, can refer an establishment to the Department of Inspections and Appeals if they are concerned about a food code violation — in this case unlined copper cups — but that is the limit of the Division’s authority in this situation. In conferring with the Department of Inspections and Appeals, the organization that oversees all of the state’s food inspectors and inspections, the use of copper cups or mugs for drinks in establishments across the state is not a major concern. This regulation has been in the FDA Food Code since 1976. Because it is a 40+ year old code, most copper cups and mugs sold in the United States are already lined with tin, stainless steel, or a lacquer — all of which are perfectly safe to drink from at any temperature. This interior lining prevents chemical reactions between copper and the ingredients of the drink and also prevents copper from leaking into a cocktail. Non-lined cups are difficult to source from commercial providers, but to be sure your cups are in compliance, look at the interior to see if they are lined with another metal or confirm with your purveyor that your cups are NSF approved. Copper exists naturally in small quantities in the human body. It’s necessary to help regulate oxygen in the blood stream, and is even found in minute amounts in our drinking water, but too much copper can cause major health problems. While acute cases of copper poisoning can be treated, long-term overconsumption of copper can lead to copper toxicity, which affects multiple systems in the body. Heating copper to hot temperatures and cooking acidic food in copper cookware present the greatest risk of ill effects. For those serving drinks in copper cups, it is worth ensuring you have NSF approved cups. The FDA Food Code, as well as the Plumbing Code, outline regulations related to copper utensils and copper plumbing. As an example, carbonators (pop and carbonated beverages) cannot have copper plumbing because they are highly acidic and, in the past, copper poisoning has resulted from acidic beverages leaching out the copper when going through these units. There is currently no state data showing how many cases, if any, of copper poisoning have been linked to consuming a beverage from a copper cup. The Iowa Restaurant Association protects, promotes, educates and advocates on behalf of Iowa’s hospitality industry with legislators, regulators, media and the public. For more information visit www.restaurantiowa.com. Monday, April 24, 2017 – West Des Moines, IA – Given the recently proposed revisions to temporary work and other VISAs, as well as the restaurant industry’s reliance on, and strong support for, the immigrant populations of the United States, the leadership of the Iowa Restaurant Association (IRA) today released a position statement on immigration. The IRA fully supports their national organization’s work with the H-2B Workforce Coalition’s efforts to exempt returning H-2B workers who worked in the United State during the previous fiscal year from being counted in the annual 66,000 cap. The Association’s immigration statement can be found here: www.restaurantiowa.com, and is also available in video form in both English and Spanish on the IRA’s Youtube channel: www.youtube.com/IowaRestaurantAssoc. 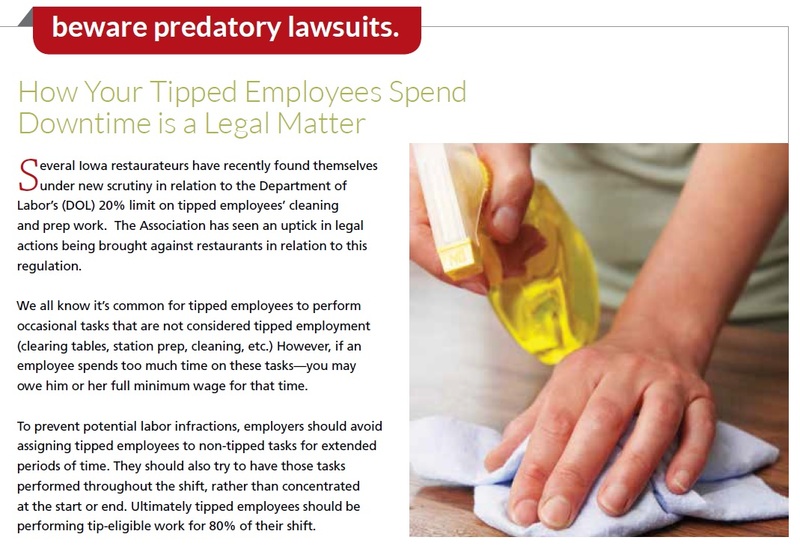 The videos were created for restaurant employers to circulate to their employees. The Association has published its most recent statewide publication featuring stories of immigrants working in the hospitality industry. The publication can be found online at www.restaurantiowa.com. For more information or a copy of the Association’s immigration materials, visit www.restaurantiowa.com.